(20 MARCH 2019)Silver spot ($):Watch 15.1900. Short positions below 15.4000 with targets at 15.2400 & 15.1900 in extension. Above 15.4000 look for further upside with 15.4500 & 15.5000 as targets. The RSI calls for a drop. (17 APRIL 2019)SILVER SPOT ($):Under Pressure. (16 APRIL 2019)Silver spot ($):Towards 14.7800. (15 APRIL 2019)Silver spot ($):Under pressure. (12 APRIL 2019)Silver spot ($):14.8000 expected. (11 APRIL 2019)Silver spot ($):Bullish bias above 15.1400. (10 APRIL 2019)Silver spot ($):Break of a ST rising trendline support. (09 APRIL 2019)Silver spot ($):Towards 15.3800. 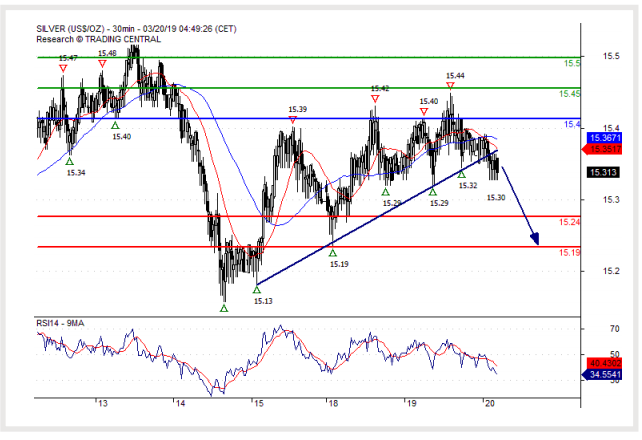 (08 APRIL 2019)Silver spot ($):15.3200 expected. (05 APRIL 2019)Silver spot ($):Range.